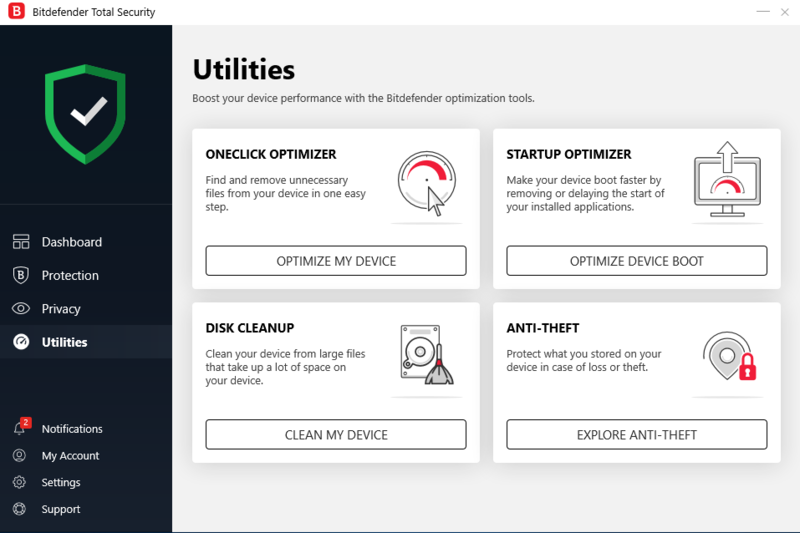 Bitdefender recently released its antivirus suites for 2019 dubbed as “Bitdefender Total Security 2019 Review.” I tested this on my Windows system. As soon as you install it, you get an Antivirus, firewall, Internet protection, password manager, PC optimization and more. It comes for Windows, macOS, Android, and iOS. Not all features are available on all platform, but most of the security features are there for all. For example, batter optimization option is now available for macOS and iOS due to platform restrictions. One purchase can protect all of your devices. You can purchase a license for either up to 5 or up to 10 devices depending on your requirement. It has a clean and straightforward interface where you can quickly access the basic and advanced options just like in previous versions. Just like any other antivirus, you have the option to perform quick and full system scans. Now the security software analyzes active applications in real-time and clocks if finds any of the applications try to perform anything suspicious. It will also then inform you to take further action. It also ensures that your activities on the web are safe. It keeps an eye on your web browsing and will notify you if you click on any malicious link. It also blocks known infected links. It also protects you from phishing pages. It also notifies if you visit a website that may try to scam you. That is something most of the Internet users need. Rescue mode of the antivirus is also impressive. Few sophisticated viruses need to be removed before your Windows starts, it detects such threats and reboots system to clean those treats in rescue mode. Autopilot feature was also the part of previous security suite but this time it has been improved a lot. It is now like an automated assistant that the company calls “personal security advisor”. It will suggest you the steps you should take to protect your computer. It will send you pop-ups of suggestions. In case you missed any, you can always go to Antivirus dashboard and head over to Autopilot section. In case you do not want these suggestions, you can disable it completely. 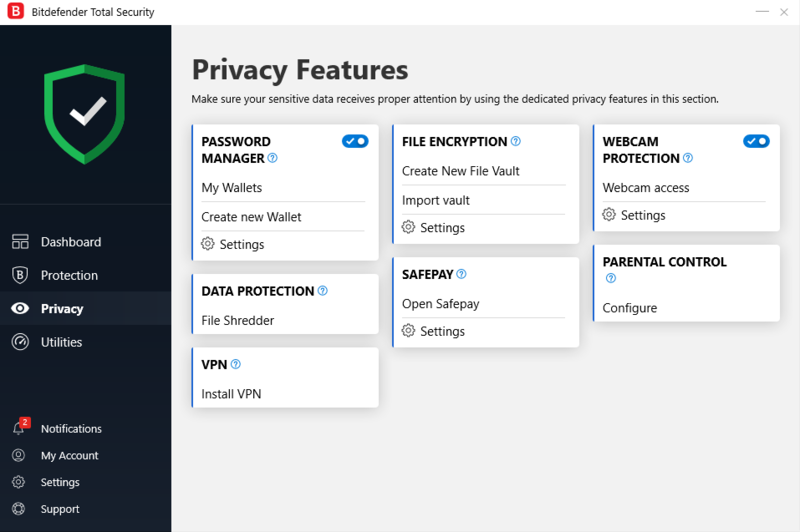 Just like previous versions, the new Total Security 2019 also comes with Parental Control feature. If you care for your kids, install it on your kids’ system or phone and limit the access or block harmful app running on their device. Parental control features can be set up using the Bitdefender central. You can also configure to receive monthly Children activity reports that will include an attempt to access blocked apps, entry in restricted areas and calls or text from blocked or unknown phone numbers. It also has one-click optimizer to remove unnecessary files from your device and optimize it. If you think your device takes to much time in staring up you can use the start-up optimizer. It removes processes that increase startup time. There is also an option for disk cleanup. Another notable feature of the antivirus is the Antitheft option that keeps your data safe in case of loss of theft. You can also always encrypt your personal important file using Bitdefender Total Security 2019. For this, create a File Vault on your PC. Choose its location, enter the size and set the password. Files kept in this vault can only be accessed by entering the correct password. There is also a built-in password manager where you can keep your passwords safely. Many people find it hard to remember all the passwords, so they usually keep same passwords for multiple services. It can be dangerous. In this case, the password manager helps. One can keep passwords here and sign-in to any website in just a couple of clicks, without entering your password. All the passwords are safe here with a master password. Total Security 2019 also comes with a built-in VPN. If you care for your privacy and do not want your ISP to know about your browsing history or want to keep yourself safe in public WiFi, you can use this VPN. This VPN is powered by Hotspot Shield and gives you 200MB of data per device per day. So, it is not as useful as you may think. 200 MB is not enough for daily usage. You can always buy unlimited Premium VPN by paying extra. Most notable addition in this version is the Ransomware Remediation that protects your system from ransomware. It can detect ransomware activities and then takes back of targeted files until the malicious processes can be closed. This is smart because the backup of the target file is important. Network threat prevention is also a new addition that detects network level activities and blocks if finds any sophisticated exploits, malware or botnet-related URLs, and brute force attacks. 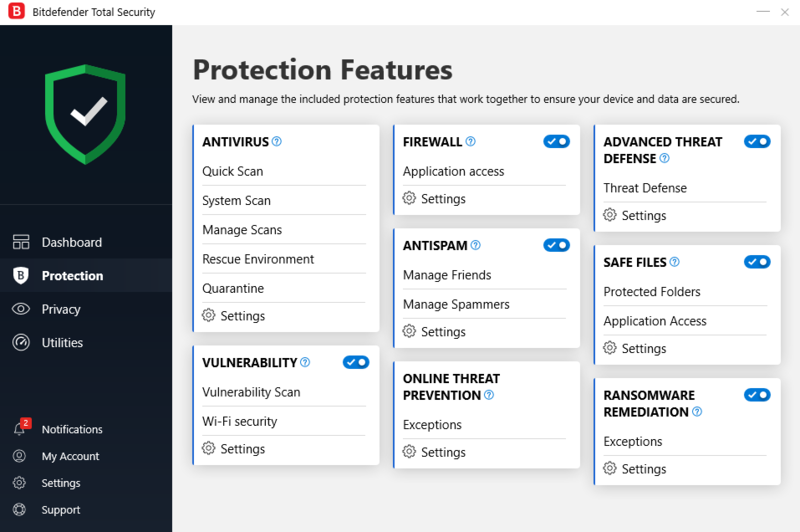 I have been using the this new Bitdefender Total Security 2019 for quite sometimes. This is keeping my computer safe, blocking any access to intrude as I can see notifications. I also felt no additional load on the system due to this antivirus. With increasing cyber threats, having a good antivirus is a need. Bitdefender Total Security 2019 is a good security suite with solid protection against viruses and internet threats along with lots of interesting features. Addition of ransomware protection makes it even better. It also comes with a VPN to protect you in open Wi-Fi hotspots and allow you to browse the web anonymously. There are lots of reason to select Bitdefender Total Security 2019.